Each day – besides the roundtable conversation after the different lectures and presentations as also indicate din the time schedule – we will have three editorial sessions, on Wednesday, Thursday and Friday. In these editorial sessions you all will be members of an editorial board with editors-in-chief Els Kuijpers, Karin Reisinger, Meike Schalk, and Roemer van Toorn. The purpose of these editorial meetings is to introduce and to let each researcher experience what editing/staging the message is as a method that frames chosen social/communicative strategies, and to show the consequences it has for the structure and visualization of its message – according to a classical or activating mentality. During the seminar the researcher will be part of and participate in an editorial process in which subject + point of view (approach) + strategy (workings) results in a plot. A plot that will be the starting point for your (spatial, digital, textual, visual, etc) design. (1) What is your research question, what subject are you addressing? An example can be the work of Scott-Brown, Venturi and Izenour Learning from Las Vegas (1972). Not only do they see that architecture is changing under influence of the media and populism in the late 60ties in America, but they also say that when architecture still wants to play a relevant societal role it needs to adapt (change) its language, or better put; its style. Rem Koolhaas asks a similar question when he studies Shopping; how can architecture be relevant in such a condition? but his take is a very different one, not one of recuperating Style, but of substance. (see also accompanied articles and interviews in the mandatory literature). When you focus on style or substance this has far fetching consequences for the plot of the format of the book. These two questions you have to explain with the help of visual material. It can be unfinished material (a series of photos, films, video, expositions, publications, architecture projects), but also all kind of material that relates (and can explain) your topic and point of view (approach), besides bringing your possibly favourite publication. 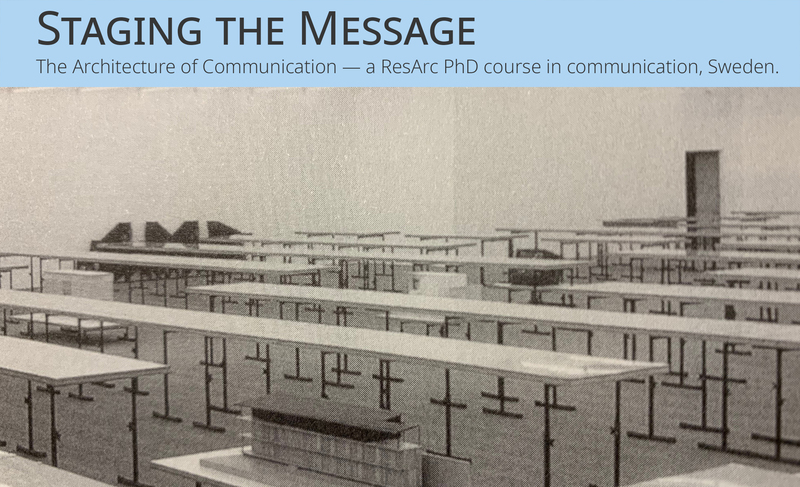 At the end of the course each researcher should be able to clearly formulate his/her own thematic, strategy, medium and visualization that could serve as a basis for the format of the PhD as a whole. At our editorial table we will have several architectural publications available (which will also be discussed and presented in several lectures) to show and to discuss how plots are developed and visualized. Roemer van Toorn, Els Kuijpers. Denise Scott Brown, The Tyranny of the Template: The Graphic Design of the First Edition of Learning from Las Vegas, in Learning from Las Vegas, Robert Venturi, Denise Scott Brown, Steven Izenour, Facsimile Edition, The MIT Press, Cambridge, Massachusetts, London, England, 2017. Beatriz Colomina in conversation with Rem Koolhaas, The Architecture of Publication, Rotterdam 2007, in AMOMA Rem Koolhaas II 1996- 2007, theory and practice, El Croquis 134/135, Barcelona, 2007. Readings that extensively address the relation between form and content can be found in the reading list below. Several of the issues addressed in these publications and articles will be referred too and addressed in the lecturer and also the editorial sessions. For the 2nd module and 3rd module seminar specific readings will be provided as well. Günther Kress, Multimodality. London, 2009. Lev Manovich, The language of new media. Cambridge/London 2001. Gillian Rose, Visual methodologies – an introduction to researching with visual materials. London, 2012. John Berger, Ways of seeing. London 1972 also available on youtube. John Berger, Selected essays and article – the look of things. London 1972. Susan Buck-Morss, Dream world and catastrophe – the passing of mass utopia in east and west. Cambridge MA/London 2000. Barbara Maria Stafford, Good looking – essays on the virtue of images. Cambridge MA/London 1996. Barbara Maria Stafford, Visual analogy – consciousness as the art of connecting. Cambridge MA/London 1999. Jonathan Crary, Techniques of the observer. Cambridge MA 1990. Michel Foucault, The order of things. London 1970. Eilean Hooper-Greenhill, Museums and the shaping of knowledge. London/New York 1992. Naomi Klein, The shock doctrine – the rise of disaster capitalism. London 2007. Armand Mattelart, The invention of communication. London 1996. Peter van Wesemael, Architecture of instruction and delight. Rotterdam 2001. Victor Burgin (ed), Thinking photography. London 1983. Martin Parr and Garry Badger, The photo book – a history, vol 1 and 2. London 2004. Allan Trachtenberg (ed), Classic essays on photography. New Haven 1980. Guy Debord, Society of the spectacle. Detroit 1970. Terry Eagleton, The function of criticism. London 1984/2006. Terry Eagleton, The event of literature. Cambridge MA 2012. Umberto Eco, The open work. Cambridge MA 1989. Fredric Jameson, Brecht and method. London/New York 1998. W.J.T. Mitchell, Iconology – image, text, ideology. Chicago and London 1986. Franco Moretti, Signs taken for wonders. London 1983/2005. Jacques Rancière, The emancipated spectator. London 2009. Robert Stam, Reflexivity in film and literature. New York 1992. Robert Stam, Subversive pleasures. Baltimore/London 1989. Nader Vossoughian, Otto Neurath – the language of the global polis. Rotterdam 2007. Hal Foster, Design and crime (and other diatribes). London and New York 2002. Rem Koolhaas, Content, triumph of realization. Cologne 2004. Jan van Toorn (ed), Design beyond design – critical reflection and the practice of visual communication. Amsterdam/Maastricht 1998. Jacques Bertin, Graphics and graphic information processing. New York 1981. Charlotte and Peter Fiell, Graphic design for the 21 century. Cologne 2003. Richard Saul Wurman, Information architects. Zürich 1996. Cartes et figures de la terre, Jean-Loup Rivière (ed), catalogue Centre George Pompidou. Paris 1980. Michael Rock 2 x 4, Multiple Signatures, on designers, authors, readers and users, New York 2013. The course on communication includes a seminar with short lectures and roundtable debate on academic publishing and potential reinterpretations. The list below shows a selection of the publications that will be discuss and look closer into with the editors during the seminar on Thursday. Hélène Frichot, Catharina Gabrielsson, Helen Runting (eds), Architecture and Feminisms (London: Routledge, 2017). Karin Reisinger, Meike Schalk (eds),Architecture and Culture, “Styles of Queer Feminist Practices and Objects in Architecture”, Vol.5 (3), 2017. Karin Reisinger, Meike Schalk (eds), Field Journal, “Becoming a Feminist Architect”, eds: Vol.7 (1), 2017. Meike Schalk, Thérèse Kristiansson, Ramia Mazé (eds), Feminist Futures of Spatial Practice: Materialisms, Activisms, Dialogues, Pedagogies, Projections, ed. with T. Kristiansson and R. Mazé (Baunach: AADR / Spurbuchverlag, 2017). Hélène Frichot, Sten Gromark, Jennifer Mack, Gunnar Sandin, and Roemer van Toorn (eds), double volume: Rethinking the social, and After Effect, Actar publishers, Barcelona, New York, 2019. Roemer van Toorn, Flat Out 3, “The Odd Couple. Travelling with Images”, UIC, Chicago, 2018. Roemer van Toorn, Jennifer Sigler, Penelope Dean (eds), The Berlage Report Hunch, 1998 – 2008, The Berlage Institute Postgraduate Laboratory, Rotterdam. Roemer van Toorn, Ole Bouman, The Invisible in Architecture, Academy Editions, London, 1994.